Neal Fischer, ELCA South Carolina Synod using NewTek TriCaster Mini. Religious communities are coming together as never before, even when congregants are thousands of miles apart. As HOW customers become more aware of what technology can deliver, they’re taking full advantage of what’s available to spread the word. Megachurches, which typically have larger budgets, appreciate this system because of their need to manage large amounts of video content. But Gauthier noted that the technology’s market isn’t limited to the biggest spenders. “Smaller HOWs, with fewer members on media teams and less money also find it to be a time saver as they can easily schedule online content without spending too much time getting content online,” he said. 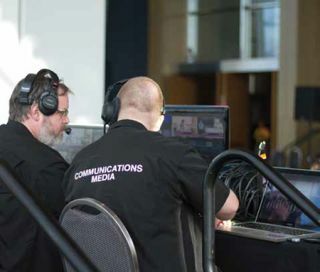 NewTek’s TriCaster Mini at the ELCA South Carolina Synod. One major difference in both the solution integration and the delivery is whether a church has multiple campuses. “That’s a distinction that, on the surface, can be seemingly divided along congregation size lines, but our smaller, more rural worship customers with lower populations are realizing economy-of-scale advantages too, often by joining forces with other small communities,” said Ellen Camloh, senior director, industry marketing, NewTek. NewTek’s latest technology offering for worship customers has the ability to join a remote interview with an international missionary or guest speaker with the live worship production by way of Skype. Although not everyone has the budget for traditional satellite broadcast distribution, with advances in IP streaming technologies and IP infrastructure, even the smallest congregation with a modest budget can stream high-quality HD video between sites,” D’Addio concluded. No two HOW customers are the same. One may represent a small congregation exploring the possibilities of streaming and archiving, while another potential client may serve a megachurch. Megachurches will probably require an HD workflow, whereas a smaller congregation might be happy with an SD stream and an integrated solution for both live production in the room and online. “Presenting different approaches, price points, workflows, and streaming services will make it attractive to each customer,” he said. Smaller churches usually start off by publishing their content online to grow their audience, so they need solutions that can help them get their content online quickly. “Larger churches will tend to focus on extending their reach to other communities by adding remote campuses that need to be connected to the main location via live streaming,” Phil Gauthier, account manager, Haivision, said. In both large-scale and small-scale cases, the challenge is to make live-streaming services seen by remote church members seem as intimate and relevant as the service conducted by the pastor in person, Camloh concluded.